After a three year sabbatical the fabled Bonbon Cabaret is back, featuring a scintillating array of talent in a variety show format at Bath Comedy's newest cool venue, the recently reopened Widcombe Social Club! 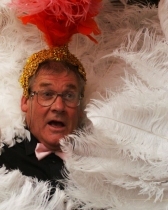 Monsieur Ralph Le Bonbon will introduce a splendiferous line-up of quality acts including character comedy and music plus, of course, the ineffable Widcombe Players; and no Bonbon Cabaret would be complete without the unmissable pickled egg raffle! Starring Marty Skiver, character comic Emma Sidi, comedy songwriter Tamar Broadbent and cabaret star Tina T’urner Tea Lady! Come and experience the continually improving wonderful space which is Widcombe Social Club, with its comfy seats, air conditioning, new acoustics, posh toilets, downstairs lounge/bar and gorgeous staff! NB: Look out for the Widcombe Christmas Tree Lights switch-on starting outside the White Hart at 6.15pm before this show - rumour has it that the Queen herself is coming to do the honours this year!